Relive favorite moments from the happiest, most sparkly and colorful TV series around with the LEGO® Unikitty™! 41454 Dr. Fox™ Laboratory. This fun and colorful set has a whole host of exciting features and functions, including a sparkle matter scanner with conveyor belt function, tilting examination table, posable robotic arms, movable lights, revolving canister holder and Dr. Fox's shrinking ray gun. The set also includes 4 buildable figures plus a Rick figure. Includes buildable Dr. Fox™, Unikitty™, Prince Puppycorn™ (with special decoration to show he has been ‘experimented on’) and Robot Helper figures, plus a Rick figure. Features Dr. Fox’s laboratory including a sparkle matter scanner with conveyor belt function, control panel with screen, posable robotic arms, examination table with tipping function, rotating canister holder, movable horn polisher, movable lights and opening drawers, plus Dr. Fox's shrinking ray gun. Accessory elements include chemical bottles and canisters with sparkle matter. 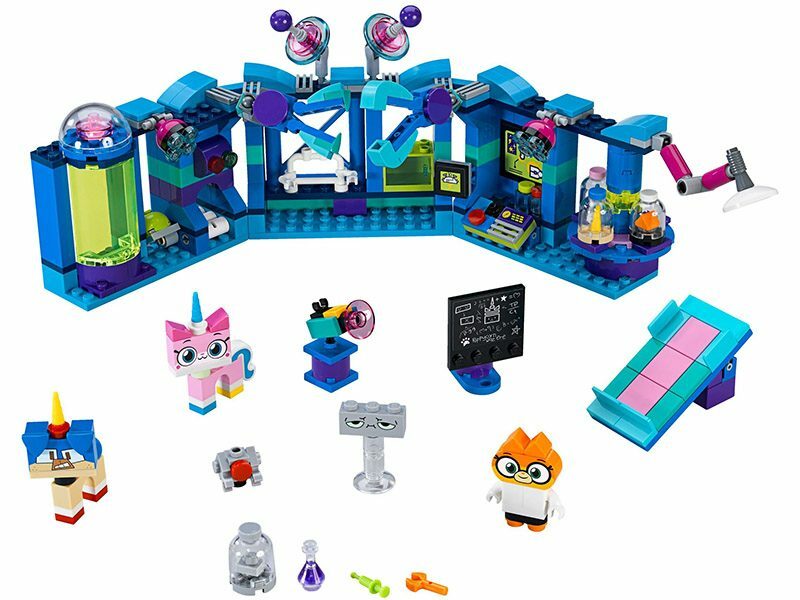 Perform experiments on Unikitty™ and all her friends with Dr. Fox™ in her incredible lab. Use the scanner to extract sparkle matter into the canisters and then send it back down the conveyor belt. Stand Unikitty™ or Prince Puppycorn™ under the horn polisher to make sure their horns are super shiny! Move the robotic arms to grab the figures and hold them in place on the examination table. Dr. Fox™ Laboratory measures over 3” (10cm) high, 11” (30cm) wide and 3” (9cm) deep.